Clouds and shadows have a tendency to shape shift. Watch one for long enough and you'll begin to hallucinate, or perhaps begin to see features emerge -- beady eyes and gnarled teeth and slits for nostrils and tree branches for limbs. 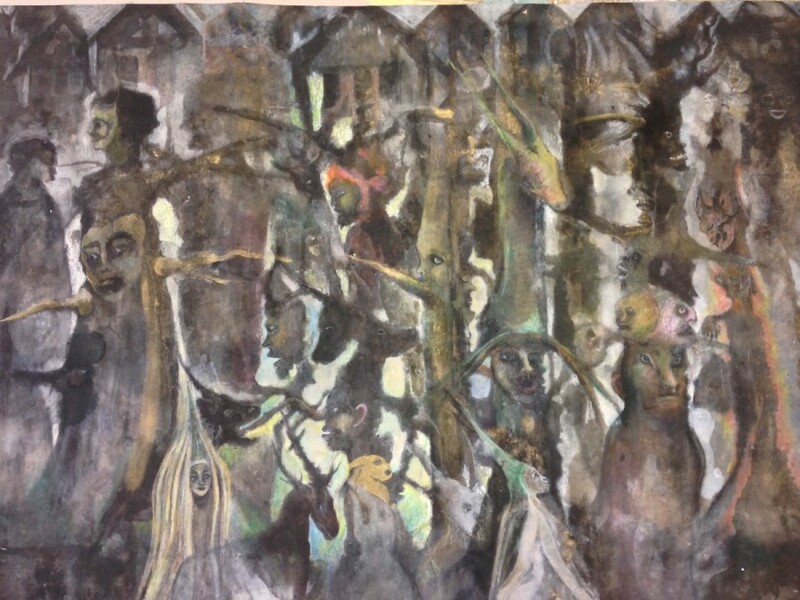 Self-taught artist Christine Sefolosha operates in this same realm of murky seeing, where what exists and what is experienced don't always quite line up. Her mixed media works, light in texture and dark in complexion, recreate the illusory feeling of losing track of a memory or scrambling to put together the pieces of a half-remembered dream. Sefolosha was born in Montreux, Switzerland in 1955. She spent much of her young adulthood in South Africa, serving as an assistant for her first husband, a South African veterinarian. During her travels Sefolosha became immersed in the African music scene amidst black communities, where she met a musician named Sefolosha, who would eventually become her second husband. The new couple would later move back to Christine's hometown of Montreux, desperate to abscond from apartheid. When they settled back in Switzerland, that's when Sefolosha began painting stories of her visions abroad. Sefolosha's works, rendered using everything from paint to tar and dirt, occupy the space of the in-between, in those very first moments when legible shapes and details emerge out of the muck. In her watery depictions, creatures dwell in the state between man and beast, in a place somewhere between reality and folklore, making the viewer feel suspended between waking life and a dream state. Spectral queens mingle with prehistoric beasts, mutant birds and anthropomorphized tree stumps, rendering a surreal limbo in a constant state of transformation. Perhaps because of her work in the veterinary field, Sefalosha incorporates wildlife into her work with a sense of intimacy and enchantment. Gazing upon her works, one feels not as if there is a strict line dividing man and beast, but rather a spectrum as liquid as her filmy artworks. "One of the predominant currents in Sefolosha’s body of work to date is a decidedly animist worldview," Annie Carlano writes in Raw Vision. "Birds and animals are majestic beings to be respected, revered and emulated. 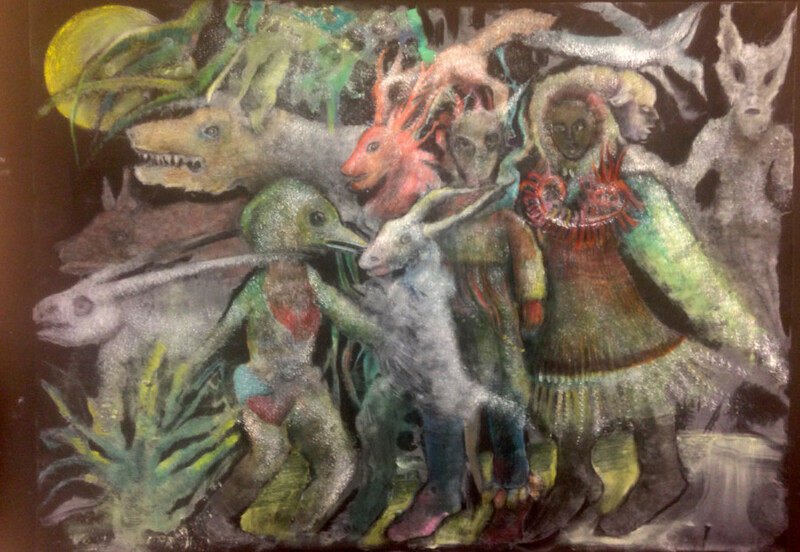 With a sensitivity most often found in members of tribal societies, Sefolosha gives us the essence of her expressionistic creatures -- their soul -- revealing an uncanny affinity with authentic animal nature." Sefolosha falls under the category of a self-taught artist -- one who creates art without training and apart from any artistic institution. 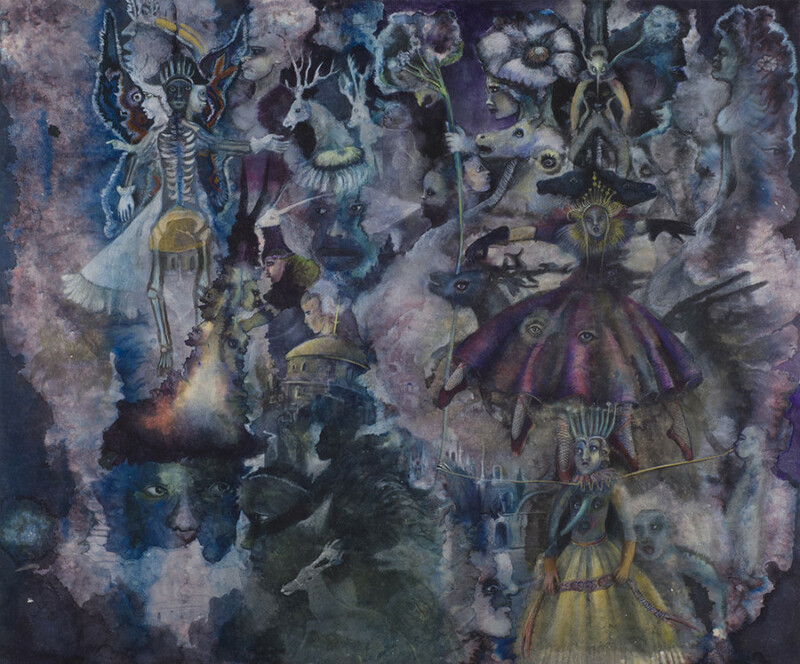 Her work draws comparisons to a wide range of images both from inside and outside the predominant art historical narrative, from primitive cave paintings to the surrealist nightmares of Remedios Varo. Unlike many of the other artists on view at the Outsider Art Fair, Sefolosha did not grow up with developmental disabilities or on the extreme outskirts of society, thus her work seems to exist right on the brink of inside and outside. However, like most rigid categories addressed in Sefolosha's work, the boundary between out and in gets lost in the haze of blues and purples, eyes and claws, memories and dreams. Sefolosha's work will be on view courtesy Polad-Hardouin Gallery at the Outsider Art Fair, from January 29 until February 1, at Center 548 in New York.